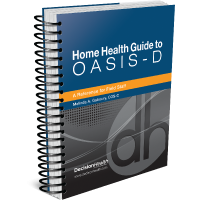 Home Health Guide to OASIS-D: A Reference for Field Staff details the latest revisions of the OASIS assessment, effective January 1, 2019, including the removal of 28 items, the addition of six items, and revisions to seven items. The latest revision of the OASIS assessment, effective January 1, 2019, includes the removal of 28 items, the addition of six items, and revisions to seven items. Among the biggest challenges for agencies grappling with the revised assessment are new items GG0170 (Mobility) and GG0130 (Self-Care). These items require scoring of actual performance and a discharge goal for a combined 24 activities. This brand-new pocket guide provides a quick reference for filling out the OASIS, with tips and callouts on new items, including which items affect case mix, rating, and value-based purchasing reimbursement. This reference explains how OASIS items fit into various assessments and provides troubleshooting tips to avoid incorrect payments, denials, and fines. While CMS expects the assessment to take less time to complete, industry experts and HCPro customers expect OASIS-D to actually take more time and contribute to lower clinician productivity in early 2019. Order this one-of-a-kind resource to accurately fill out your OASIS every day. Melinda A. Gaboury, COS-C, is cofounder and CEO of Healthcare Provider Solutions, Inc. She has over 20 years of experience in Medicare home health reimbursement and has remained on the cutting edge of Medicare PPS since the regulation’s inception. She has helped her clients bridge the gap between clinical and financial issues and has been a seminar and webcast presenter for 21+ state homecare associations. 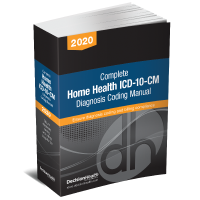 She is also the author of Home Health Pocket Guide to OASIS-C2.